Corrosion exists in almost every fire sprinkler system installed. Some systems are always filled with water – wet pipe systems. Some systems have air in the pipes until the system is called to fill with water – dry pipe and pre-action systems. Both wet and dry systems have corrosion issues, but they are dramatically worse in dry systems. 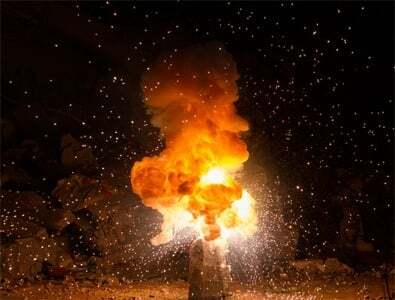 Most people have heard of the Fire Triangle. Since this is a Fire Protection blog, we like to explain corrosion in fire sprinkler systems by using the Corrosion Triangle. 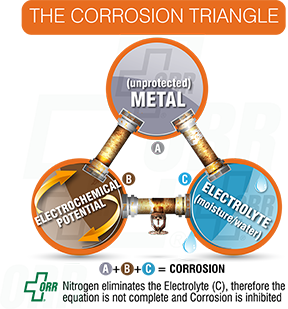 In the corrosion triangle, when water, metal, and oxygen come together, corrosion will occur. Oxygen provides the electrochemical potential, water is the electrolyte and the unprotected metal finishes the chemical equation. The best way to stop corrosion is to eliminate the use of metal piping. Unfortunately, that isn't practical in most fire sprinkler systems. The sprinkler industry sometimes uses plastic CPVC pipes for fire sprinkler systems, but most commercial systems are large enough that they must use steel pipe. Furthermore, building owners and engineers desire steel pipe for its durability. The second best way to stop corrosion would be to eliminate the water. Even though we do our very best to keep dry systems dry, the fact is, that there's always going to be some water in the pipes to keep the corrosion triangle at play. It's important to understand that bacteria can be an accelerator to the corrosion process. The MIC bacteria cause pitting and pinhole leaks to occur faster in sprinkler systems when they are present. Leaks can still occur without MIC, but generally it takes longer. Waterborne bacteria can either be aerobic or anaerobic. Aerobic bacteria need oxygen to survive, anaerobic do not. In dry sprinkler systems there is always plentiful amounts of oxygen present in the compressed air stream used to supervise (pressurize) the system. If oxygen was taken out of the system, aerobic bacteria could not survive. Anaerobic bacteria would also eventually die in a system without oxygen, as they use dead aerobic bacteria for food. MIC has existed in other piping systems for years and is dealt with using chemical biocides mixed in with the circulating water. Biocides and chemical corrosion inhibitors could work for sprinkler systems, but in practice, they have proven difficult to apply. The static water conditions in fire sprinkler systems (when no sprinklers are activated), make it hard to distribute the chemicals. Several industry studies have shown the presence of MIC to be very random. One building's sprinkler system may have it, while the one in the building next door does not, even though they share the same public water supply. There is no predictor that your building will have MIC. One thing is for sure, when you have it, the most common indicator is leaks in your sprinkler system. Today there are sprinkler systems being installed that will develop leaks and external pipe corrosion after just one year. Knowing about the possibility of MIC being in your sprinkler system is the first step. Testing your sprinkler system for MIC is the next step. There are many commercially available kits that can help you know if you are at risk for MIC in your sprinkler system. There is a solution to corrosion; adding a Nitrogen Generation System can greatly reduce corrosion in sprinkler systems. We will be covering more on this topic in our Fire Protection Blog in 2014. Click here (link) for more information about Nitrogen Generation Systems. Know for sure if your system has succomb to the effects of MIC and the corrosion process by scheduling a non-destructive pipe test with ORR Protection Systems today. We will help make sure your systems are ready to perform when called upon. CLICK HERE. ORR Protection will host a Lunch & Learn training program at your location on the topic of corrosion in mission critical dry and preaction sprinklers or another topic of your choice. We look forward to the opportunity of educating your team, and we will provide lunch! CLICK HERE.